His Eminence, Archbishop Seraphim will be at St. Vladimir’s this weekend. Please mark these events and bring yourself as well as your family members and friends. All are welcome. Personal interviews with the Archbishop — Saturday morning and afternoon. Saturday, Nov 14 at approximately 6:30 PM: Potluck Supper with Archbishop Seraphim at the home of Peter Efthymiadis (479-0590). Atmosphere is informal, and all, Orthodox or not, are welcome. Sunday, Nov 15 at 9:45 AM: Divine Liturgy, followed by Potluck Lunch at Church. After lunch, there will be a Molieben (short prayer service) to bless our initiative of looking for a new church space. Your attendance is important, as your opinion and input about this initiative are necessary in order to go forward. Please remember that contributions to the Potluck Supper (Nov 14) and Potluck Lunch (Nov 15) are greatly appreciated. For information about what to bring, please contact Peter at 479-0590 or Leslee at 405-9691. Thanks, and see you there! The Parish of St Vladimir’s congratulates Olha and Denys on the birth, May 20, of their second child, a son, named “Mishko”. We have been invited by St. George’s to participate in their annual Yard Sale on June 13, 2009 from 9-12 Saturday morning. Our group will have several tables, and set-up is on the Friday evening, June 12. Please bring items to our Church beginning May 29. They should be clean and in working order. Volunteers are needed on Friday, June 12, from 5-9 pm to help sort, tag, and set up items for the sale on Saturday morning. Volunteers are also needed to help at the sale on Saturday morning, June 13. Please consider donating an hour or two of your time on Friday or Saturday to help raise funds for St. Vladimir’s. Many hands make light work, and it’s a lot of fun, too! Click here to download our Pentecost Newsletter (PDF format). Everyone is invited to continue celebrating as a community the Resurrection of our Lord from 4:00-8:00 pm, Pascha Sunday, April 19, 2009 at Jonathan & Cindy Goossen’s home (34 Kirtland Court, Dartmouth). Bring festal food and drink to share. Coffee/tea/punch/pop will be provided. Please plan to attend! First of all, have a happy and blessed NEW YEAR 2009! Saturday, January 3: Chrismation of Andrew Alain at 3:00 pm. All are cordially invited. Vespers at 5:30 pm, followed by reception of D’Arcy Starratt as a catechumen. Sunday, January 4: Divine Liturgy (Forefeast of the Nativity) at 10:00 am. Confessions available by appointment with Fr. Vladimir later on Sunday afternoon and early Sunday evening. Monday, January 5: Confessions available by appointment with Fr. Vladimir Monday afternoon or early evening. Fr. 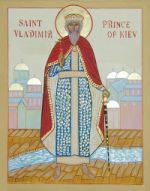 Vladimir stresses that no confessions are possible on Tuesday, January 6, so that everyone should arrange to have confession by appointment with him before Tuesday. Fr. Vladimir can be reached at (902) 543-1760 until Saturday morning. After that he will staying with Reuben at 404-7311. Tuesday, January 6: Baptism of Tom Froese at 2:30 pm — all are cordially invited. Feast of the Nativity at 9 pm, followed by the Nativity potluck dinner upstairs in St. George’s Church Hall. All contributions to the potluck dinner will be greatly appreciated. Also, all friends and relatives are welcome to the Nativity Liturgy and dinner. Wednesday, January 7: Reuben is hosting a Christmas Evening potluck at 6 pm at his place, 2643 Fuller Terrace. Please bring potluck food and Christmas treats.